The Radium Engineering fuel pump hanger allows the use of 1 or 2 aftermarket pumps in the stock Mitsubishi Evo X fuel tank. The machined assembly drops-in the factory fuel tank using the OEM hold-down flange. A single 8AN male pump feed port and 6AN male return port simplify aftermarket -AN hose plumbing. Electrical hardware is included for the fuel pump power, OEM level sender, and OEM temperature sensor. One major issues with the OEM EVO X fuel pump hanger is the restrictive return port and venturi jet pump. When using aftermarket high-flow fuel pumps, the OEM jet pump becomes too restrictive creating unwanted backpressure in the regulator return line causing excessive fuel rail pressure. The Radium fuel pump hanger includes a venturi jet pump with a new pressure-relief valve to minimize back pressure. The kit also includes a 2-piece anodized aluminum collector box that sits at the bottom of the OEM fuel tank. This container is NOT a total solution to fuel starvation, but does improve the fuel supply around the pump(s) inlet. There are two 1" ball check valves incorporated on the front and rear of the box that serves as trap doors keeping the pump(s) supplied with fuel during aggressive driving. Furthermore, all returning fuel from the pressure regulator return and the crossover hose enter the collector box keeping it full. The collector box also permits a mounting solution for the OEM fuel level and fuel temperature sensors. Also included are 2 mating connectors for the sensors making the kit easily serviceable. Single pump applications can reuse the OEM fuel pump controller wiring, but it is recommended to upgrade the OEM wiring as high flow fuel pumps draw additional current requiring larger gauge wire. Fuel pump wiring kits can be purchased HERE. Select qty1 for single pump applications and qty2 for dual pump applications. 1. There will be enough components included with this option to use 1 or 2 fuel pumps. Depending on the setup, some parts will simply not be used. 2. A pliable fuel pump filter sock like this must be used for proper fitment. Next, select the type of pumps that will be used so the appropriate internal wiring connectors will be included in the kit. If pumps are needed, the kit will come preassembled and 65 micron sock filters will be installed on all fuel pumps. This kit eliminates the OEM hanger's "post" fuel pump filter. A low micron aftermarket fuel filter should be installed downstream to protect the injectors from debris. NOTE: the optional fuel feed kits listed below include a post pump filter. The feed kits include everything required to connect directly to an aftermarket (-8AN male) fuel rail for both single and dual pump configurations. PTFE -8AN hoses attach to a Radium Engineering fuel filter that mounts underneath the vehicle using a specifically designed EVOX bolt-on bracket. Depending on the kit selected (-01,-02,-03), the fuel filter will be assembled with 1 of 3 different elements. 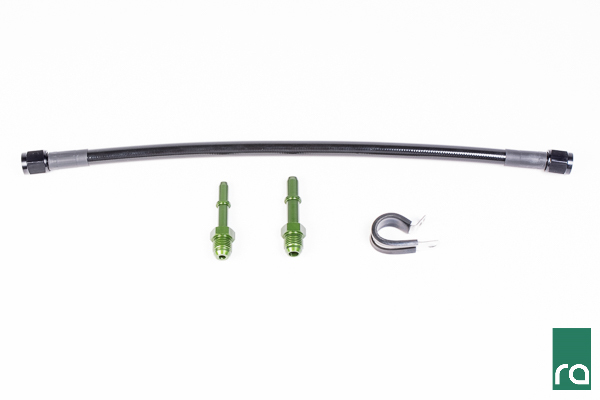 The return kit provides all of the necessay hose, fittings, and hardware to convert the OEM Evo X fuel feed line to be used as the return line. This is a method to replace the restrictive 1/4"(6.5mm) OEM return hose. In the engine bay, the -6AN PTFE return hose will attach directly to a Radium DMR if mounted in the top port of a Radium fuel rail. The two SAE quick connect fittings allow each end of the OEM feed line to be connected in an easy, leak-free manner to the rest of the kit.